Seville is an easy 2 hour flight from Paris. 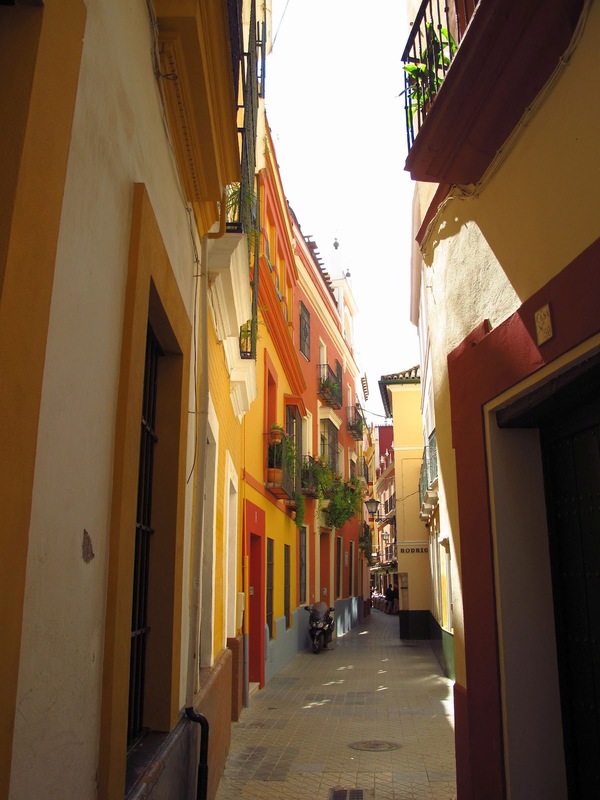 The city is immediately captivating with its strong splashes of color. Bright yellows and reds dot the landscape, as if a fresh coat of paint had just been applied. We stayed in a nice central location at Hotel Alminar, which was perfectly adequate with the bare necessities, and a decent size bathroom. 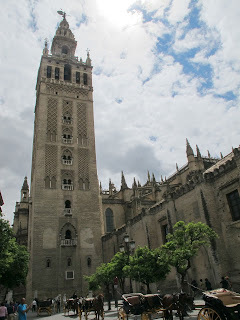 It was on a walk street that led directly to the Cathedral with the Alcazar just behind it - our first stop. 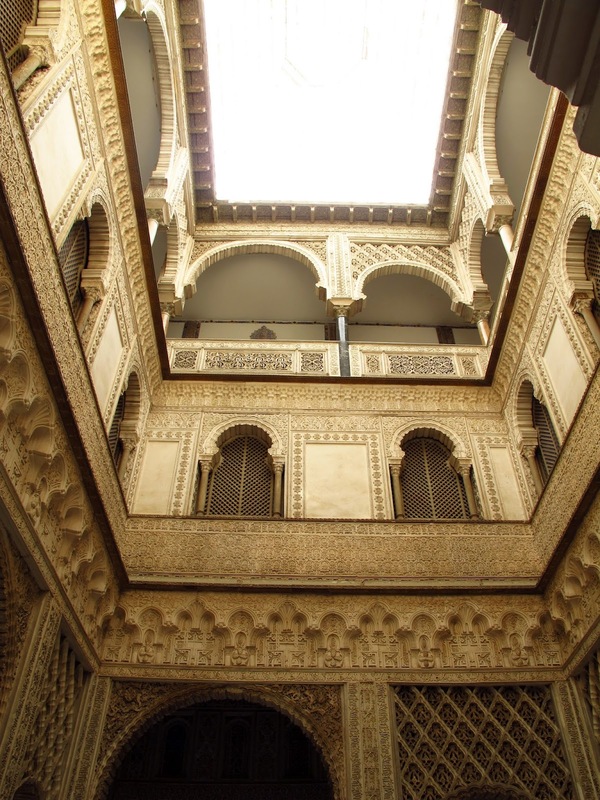 The Alcazar was originally built as a fort in 913 for the governors of Cordoba. Since then, it's been through many different rulers, cultures and tastes. It's still considered a royal palace, with weddings and visits by the Spanish royal family. 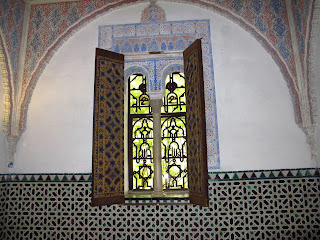 The Muslim influence is evident throughout, and some of the tile work took me right back to my recent Moroccan adventure. After the Alcazar, it was off to the Plaza de Torres de la Real Maestranza, aka, the bull ring. This ring is the oldest in Spain and one of the most prestigious where only the top fighters perform. I've been re-reading Hemingway's The Sun Also Rises which seems as close as I need to get to seeing an actual bullfight. In the 19th Century, the King decided bullfighting could be a "show," but there would be specific rules around it. Bulls are brought in 24 hours before a show for a vet to check them to ensure they are ready for the fight. Yes, they must be healthy enough to die the next day. Shows are usually 2 hours and the bull is generally killed only in the last few minutes, and the killing is supposed to be swift with the least amount of suffering. It takes 3 horses to pull the dead bull out seeing as they weight over 1,000 pounds. They are then taken to the local butcher and if they're deemed ok to eat, the butcher chops them up, and voila, dinner. We did not eat any bull for dinner that night, or at any point during our trip. 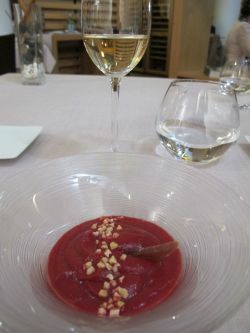 We did have a wonderful, multi-course meal at the Michelin starred Abantal our first night. We had unique wine pairings that had us going from white to red, back to white and red again. 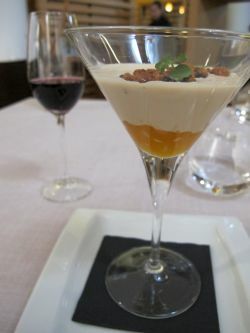 There were many highlights including a cold, beet soup, and an amazing foie gras parfait with a peach compote, and BACON. 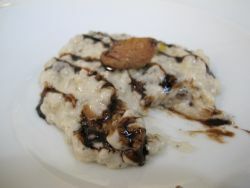 Next there was an oyster in a cauliflower cream and then a creamy, risotto with mushroom. 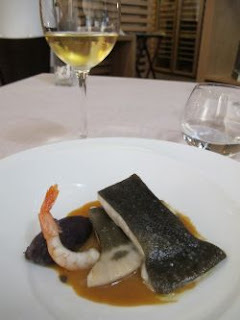 Our mains were turbot with potatoes and shrimp, and a perfectly braised lamb. We had seen the chef pop his head out once before our meal started, then several hours later after it was over. It seemed to me he was looking for feedback, so I waved him over and raved about his cooking. He seemed pleased, as was I from a wonderful meal. The next day we started with the lesser celebrated church, Iglesia del Salvador, which I have to say, was one of the highlights of the trip. It's a small church built in 1674 off of Plaza del Salvador. 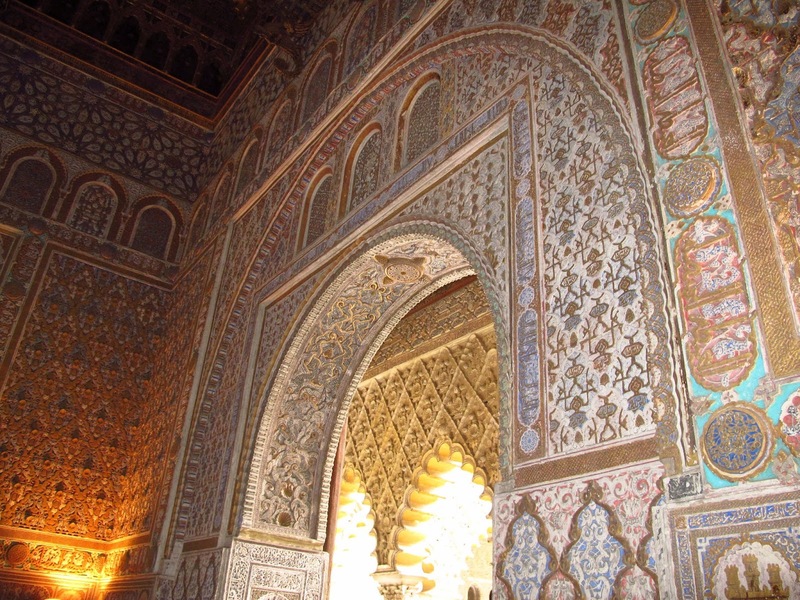 There were ornate, three dimensional displays, depicting various religious scenes. Another good reason to go to Iglesia del Salvador is that you can buy a combo ticket for that church, along with the Cathedral, which saves you from standing in the long line at the Cathedral. After visiting the intimate Iglesia del Salvador, the Cathedral was a bit overwhelming. It's the largest in the world and hordes of people were everywhere. It was difficult to really feel the size due to separate rooms and columns breaking up the view. It was a mosque with minaret in the 12th Century, and after the Christians took over Seville, it was converted to a church in 1401. 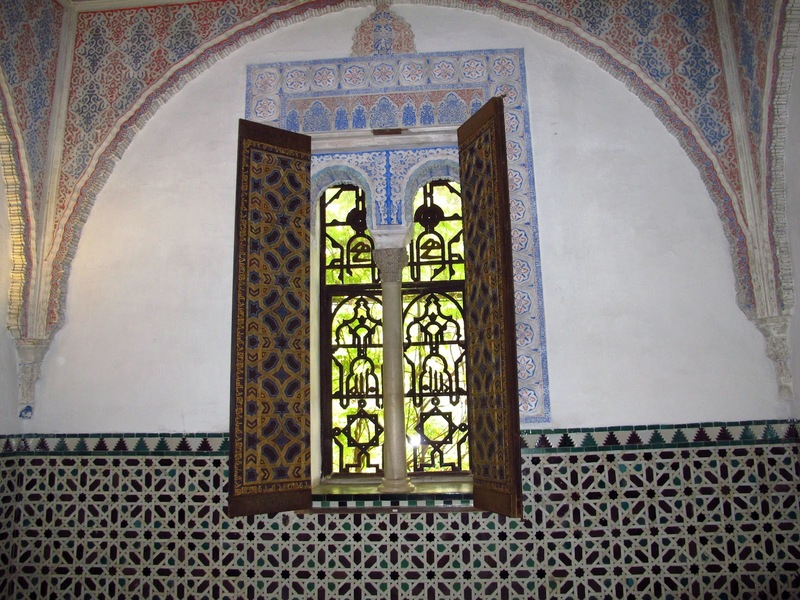 We climbed the 37 floors of the minaret, which was actually a ramp, so not as difficult as stairs. Beautiful views could be seen on the way up and once at the top of the nearly 3000' high tower. 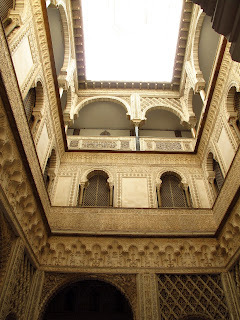 We then visited Casa de Pilatos, which has been called the poor man's Alcazar. 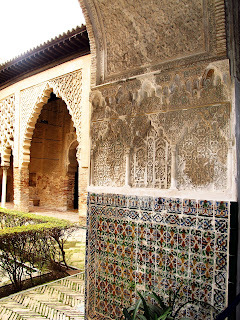 It's a mix of styles and tile work, and while beautiful, was a bit diminished by the grandeur of our previous sites. We enjoyed our tapas eating in Seville, and learned as we went. 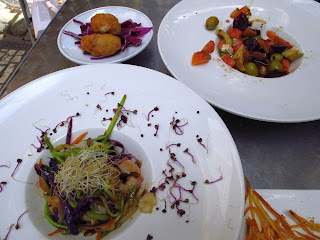 I love getting many different tastes of food, but we slowly learned to cut back on the fried food entries. As good as fried anything is, it can leave you a little heavier on your feet by the end. 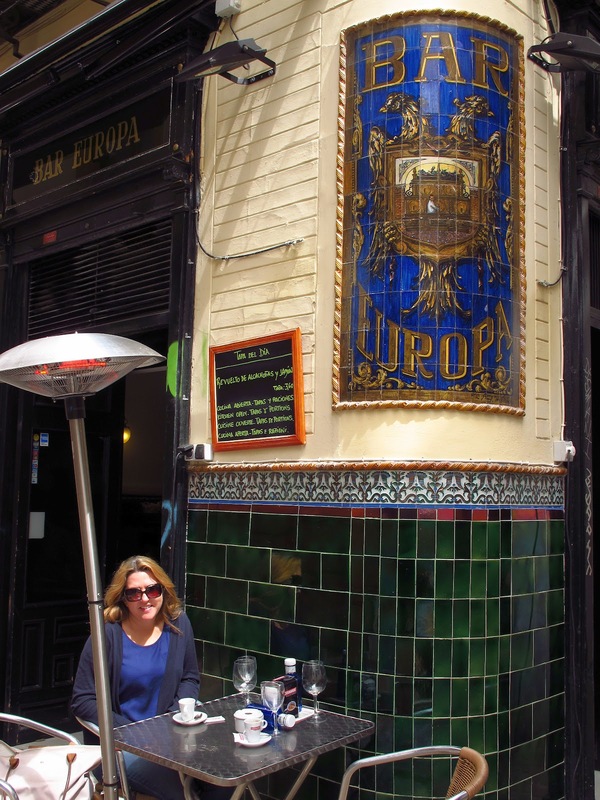 We had a good lunch at Bar Europa and an even better one at Los Coloniales. There's only a few outdoor tables at Los Coloniales and the wait was really long, so we bellied up to the bar and ended up chatting with the locals and getting some good food recommendations. This was also the beginning of our new interest in Spanish men. All the Spanish men we met were so friendly and helpful, and yes, it might just be because we're used to more stand-offish French men. The love of Spanish men was further solidified after attending an amazing flamenco performance. 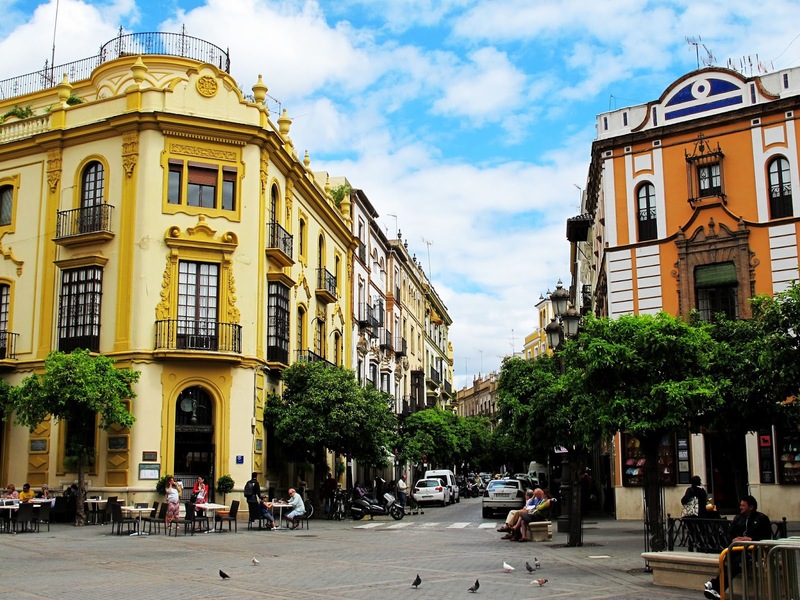 Seville is home of flamenco, so when in Rome. 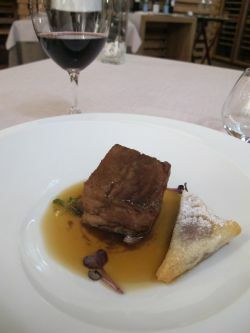 We didn't want to do a whole sit down dinner, so we found a good, one hour performance at the Museo del Baile Flamenco where you didn't have to buy bad food or a drink. We were thoroughly entertained by the live music, singing, the unreproducible snapping and hand clapping, and unbelievable dancing. After the wonderful performance, we went to the hip, after hours area of Almeda de Hercules - only it wasn't too happening. It was pretty cold and also spring break week, so perhaps that's what kept people away from the horse shoe shaped outdoor plaza filled with bars and restaurants. 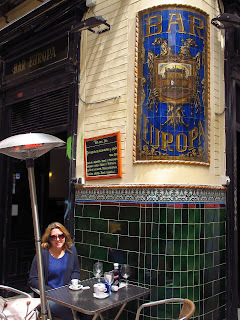 The kids were all hanging in one bar, but we didn't think we met the age or sweatshirt requirements, so we found another spot still happening for some more wine and end to our fabulous time in Seville.